Callout Size: Queen. Double Knit corners for snag protection. Product Type: Box Spring Cover. Material: Stretch-Knit Polyester. Size Full - Xtra Long, 54" x 80" x 9". Blocks allergens, microtoxins, dust mites and bed bugs. Box springs / foundations provide the perfect hideout for bed bugs. CleanRest is the world's most trusted and technically advanced sleep and bedding protection featuring patented MicronOne fabric technology. For a TWIN bed. Machine wash and dry. 233-Thread count. Protects mattress and box spring from invasive insects. Fabric is comfortable and breathes well. Fits mattresses up to 16 in. Prevents mattress stains. Queen size fits up to 60 in. Linen Type: Mattress Protector. In fact, AllerZip® mattress covers are bed bug entry and escape proof. 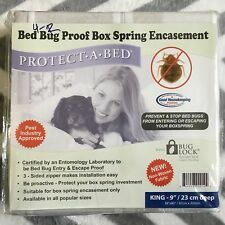 Sleep Safe Zip Cover Bed Bug Vinyl Box Spring Encasement Protector - Queen 9"
Queen: 60" x 80" x 9". We are happy to assist you. ZONE DEFENSE 3 Allergen Bed Bug Blocking King Box Spring Encasement 78" x 80"
Allergen & Bed Bug Blocking. ZONE 3 by ZONE DEFENSE SYSTEM. 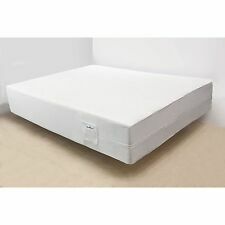 Box Spring Encasement, queen size, CleanBrands CleanRest Pro 60" x 80" x 9"
Once inside, they can spread rapidly. Bed bugs are great hitchhikers and from place to place in luggage and your personal belongings. Bed Bug Proof Box Spring Cover. Any bed bugs you seal up in the bed bug boxspring cover cannot escape from the cover, and will eventually die. Machine washable in warm or hot water. Do not bleach or dry clean. 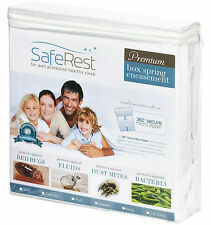 Sleep Safe Zip Cover Bed Bug Vinyl Box Spring Encasement Protector Long Twin 9"
Twin XL: 39" x 80" x 9". We are happy to assist you. This product, when installed properly, is certified to be bed bug proof. It has been tested by a BOARD CERTIFIED ENTOMOLOGIST to insure maximum results guarding your mattress & box spring against a bed bug infestation. Sleep Safe Zip Cover SECURE Box Spring Encasement Protector - Cal Long Twin 9"
Sleep Safe ZipCovers SECURE Box Spring Cover is a cost effective alternative to vinyl covers. Cal Long Twin: 37" x 84" x 9". 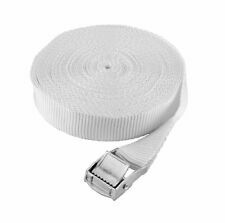 This new SECURE fabric is a non woven spun bonded material with a special water resistant UV coating. This is for set of 2 - Long Twin Sleep Safe ZipCovers. We are happy to assist you. CALIFORNIA KING SET - MATTRESS COVER & 2 BOX SPRING COVERS. This product, when installed properly, is certified to be bed bug proof. It has been tested by a BOARD CERTIFIED ENTOMOLOGIST to insure maximum results guarding your mattress & box spring against a bed bug infestation. 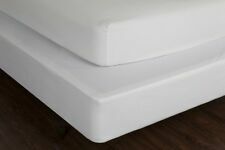 Size:Queen Â |Â Color:Ivory The Sleep Plush Box Spring Cover is the simple and stylish way to dress up a mattress foundation and provide a clean finish to your bed. Made of four way stretch fabric, this cover is designed with deep corner pockets that stretch to provide an easy and sturdy fit. Twin XL 9" standard profile. Paint And Paint Supplies. Callout Size: Queen. Heating And Cooling Supplies. durable stretch knit fabric. Double Knit corners for snag protection. Machine washable. Product Type: Box Spring Cover. Material: Stretch-Knit Polyester. 6-in-1 protection benefits which include protection against bed bugs, allergens, dust mites, pet dander, odors and water based spills. Box spring cover designed for easy and secure use. Paint And Paint Supplies. Heating And Cooling Supplies. durable stretch knit fabric. Double Knit corners for snag protection. Machine washable. Product Type: Box Spring Cover. Material: Stretch-Knit Polyester. Won't hang down or obstruct under-bed space. Maintenance-free, white colored box spring cover won't hang down or obstruct under-bed space. Made of four way stretch fabric, this cover is designed with deep corner pockets that stretch to provide an easy and sturdy fit. This product, when installed properly, iscertified to be bed bug proof. 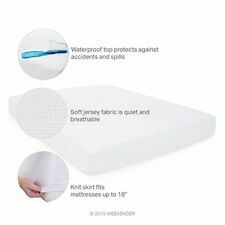 It has been tested by a BOARD CERTIFIED ENTOMOLOGIST to insure maximum results guarding your mattress & box spring against a bed bug infestation. Sleep Safe Full Box Spring Protector Premium Anti Bed Bug Cover Waterproof New. Condition is New with tags. Shipped with USPS Priority Mail. This box spring cover is machine washable and is backed by a 5 year limited warranty.Full Size. We need to send an invoice for any place outside the lower 48 states. Fashion Bed Group Box Spring Encasement king Complete Bed Bug Protection Boxspring Encasement - New in Package! Complete Bed Bug Protection Completely covers boxspring to provide a barrier against bed bugs, dust mites, and pet dander. Easy Installation - designed to fit virtually all boxsprings and foundations Machine Washable Protects from bed bugs, dust mites, and pet dander. Twin 12" X 39" X 72". Bed bug, Dust mite & Allegen Proof barrier - Great for college dorms. I am here to exceed your expectations! Master Card. (within the continental US ONLY!). The Sub Zero Mattress Protector is a fitted sheet style protector featuring Phase Change Material or PCM based fibers. Ice Touch fabric is icy cool to the touch and has temperature regulating technology to repel heat and keep you cool, dry and comfortable.